Idē nēnu korēdi by Si. Ānandārāmaṃ. Macilīpaṭṇaṃ : Yaṃ. 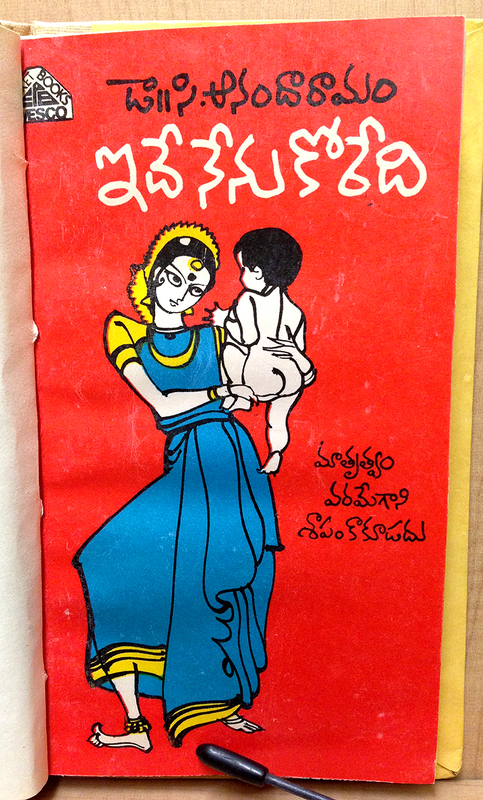 Śēṣācalaṃ ; Secunderabad : Andhra Pradesh Book Distributors, 1977. From the University of Chicago Library. ఇదే నేను కోరేది Ide Nenu Koredi (possibly translates to “I want the same thing”), Telugu novel by సి. ఆనందారామం C. Ananda Ramam. C. Ananda Ramam is a celebrated female Telugu author of over 60 works, some of which were adapted for film. Her novels tend to focus on family life, as the above image certainly indicates! The illustration and lettering both remind me of the style used by famous Telugu cartoonist/director/artist, Bapu. Could this possibly be his work? Or a copycat artist? Or was this just a very commonly-used style of the time? I’m not sure. But I just love the way the vowel signs are so prominent! I find this style of handwriting, with a rather thick stroke, very appealing!